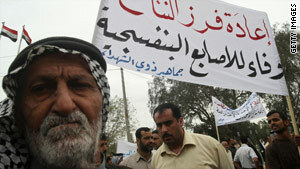 Iraqi demonstrators call for a recount of votes from the general election during a protest in Basra on Wednesday. (CNN) -- Hundreds of people supporting the political party of Iraqi Prime Minister Nuri al-Maliki took to the streets of Basra on Wednesday to demand a manual recount of Iraq's March 7 election. Al-Maliki also has asked for a manual recount. Supporters of his State of Law election bloc marched outside the provincial government's offices in central Basra, in southern Iraq, to urge the Independent High Electoral Commission to count the votes again. A few days ago, hundreds of al-Maliki supporters took the streets of Najaf and Karbala to demand a manual recount. The Independent High Electoral Commission, however, has rejected his demand. Spokesman Judge Qassim al-Aboodi has said there must be "compelling reasons" and strong evidence of widespread fraud for a recount. Saad Al-Rawi, a commissioner with the electoral body, told CNN Wednesday that "we made our decision a few days ago and nothing is going to change it. There will be no manual counting and this is according to IHEC's professional standards." Al-Rawi said that the final election results will be announced on Friday. Votes from the election are still being tallied, and the race is too close to call. Despite calls for a recount, the United States does not perceive a political crisis in Iraq, a senior U.S. official told reporters this week. The United States is "sensing no panic, no crisis" though he acknowledged that among some Iraqis there are "certainly concerns about the tabulation process and the way it's been carried out." The United States expects that most candidates will respect the ultimate outcome because Iraqi law has created a process to resolve questions about election results, the official said. Most people, the official said, "want to continue with the process as it is and they certainly want to see a successful outcome to what up to now has been a fairly, impressively carried out election."